All too often we look at our lives and wonder, "Is this really how life should be for a Christian?" God has made glorious promises to his people in Scripture. Has he failed us when we suffer through sickness, unemployment, broken relationships, recurring sin, or other trials? Those caught in painful, stagnant, or simply unglamorous circumstances find a sympathetic figure in Abraham, who spent years living in the gap between promise and reality. Working his way chapter by chapter through the Genesis account of Abraham's life, Iain Duguid shows how Abraham, in both his faith and failure, points to Jesus and the gospel, providing an example and a profound encouragement for us today. "I am grateful for this eminently accessible book . . . which closes the gap between Christ's redemptive work and the work of Abraham." 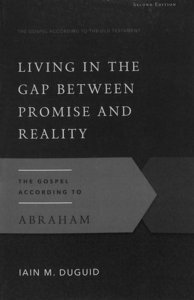 About "Gaot: Living in the Gap Between Promise and Reality: The Gospel According to Abraham, 2nd Edition (2nd Edition)"
:All too often we look at our lives and wonder, Is this really how life should be for a Christian ? God has made glorious promises to his people in Scripture. Has he failed us when we suffer through sickness, unemployment, broken relationships, recurring sin, or other trials?Those caught in painful, stagnant, or simply unglamorous circumstances find a sympathetic figure in Abraham, who spent years living in the gap between promise and reality. Working his way chapter by chapter through the Genesis account of Abraham's life, Iain Duguid shows how Abraham, in both his faith and failure, points to Jesus and the gospel, providing an example and a profound encouragement for us today.